In the context of the 375th anniversary of the founding of the city, Maison Saint-Gabriel, museum and historical site, is proposing a new temporary exhibit that dares to explore a subject that is seldom talked about. During this year of historical festivities, the museum is presenting, with 375 Years in the Heart of it All !,the legacy of Montréal’s women’s religious communities. The exhibit gives a fresh look at the history of Montréal’s women’s religious communities and the contributions they have made since the founding of Ville-Marie (1642) to the present day. Do your grocery shopping and retrace 200 years of food in Montreal! Explore the places that have marked life in the neighbourhood, like public markets, small grocery stores and the first grocery chains. Follow the evolution of products through different eras. Also, see the beginnings of the food processing industry, which develops in response to a basic need: to feed the neighbourhood and feed the city. It is an occasion to reflect on contemporary issues and to take note of grassroots initiatives making their mark on a modern city. Les Jardins Gamelin will host a rich and varied roster of cultural and citizen-driven activities, every day and night of the week. Thanks to an engaging design by Pépinière & co, including an outdoor restaurant, Les Jardins Gamelin will be a great destination for al fresco lunches, extended after-work drinks and lively weekends for the whole family. Urban agriculture is a key feature of this warm-weather incarnation of Place Émilie-Gamelin. The Sentier Urbain organization is responsible for the gardens, vegetable plots and other greenery that will enliven the space for the season. 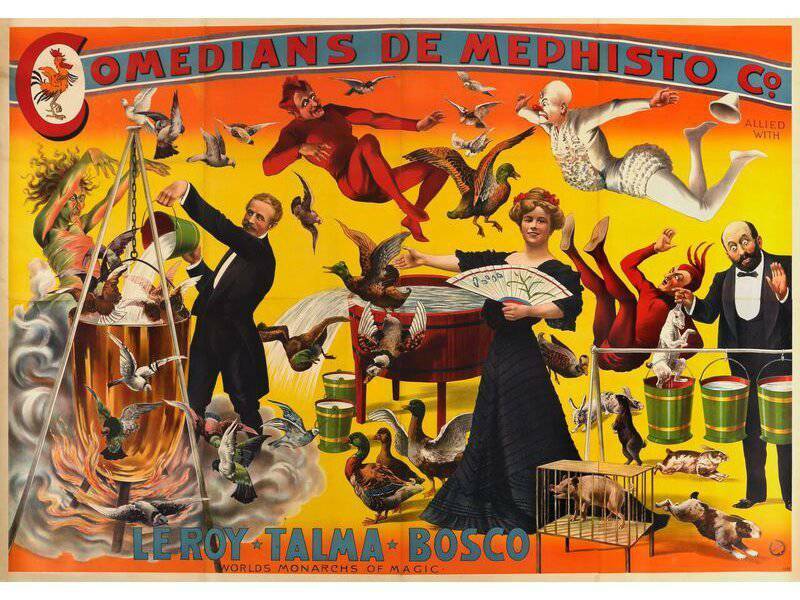 The exhibition will take on the period of magic shows’ golden age and its advertising and promotional mechanisms that relied on phantasmagoric imagery. A selection of breathtaking posters, mostly dating from the late 19th and early 20th centuries, will retrace the social history of this still active phenomenon. These posters, halfway between art and advertisement, are magnificent, large format chromolithographs that immortalise the magicians and the acts that marked the world of modern magic. This public art exhibition of international scope is part of the official program of Montreal’s 375th Anniversary. 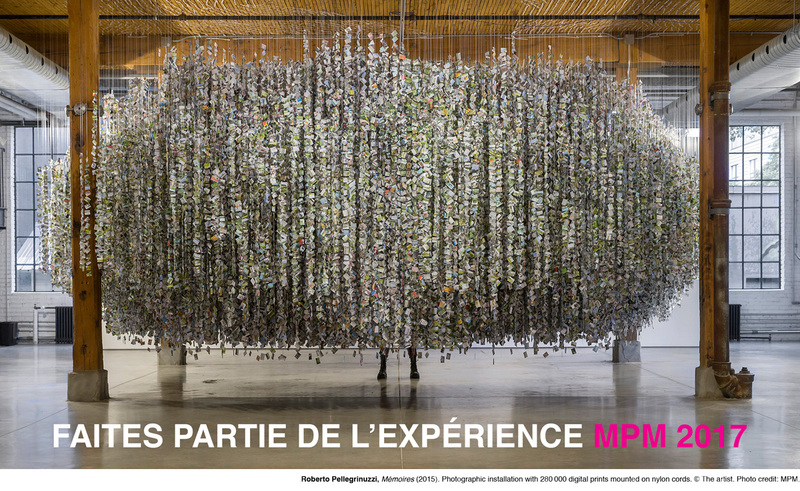 It has been designed and organized by the Montreal Museum of Fine Arts with the support of McGill University. It commemorates two other major events, namely the 50th anniversary of Expo 67 and the 150th anniversary of Canadian Confederation. A genuine outdoor museum, La Balade pour la Paix will extend, with the support of the City of Montreal, one kilometre along Sherbrooke Street between the MMFA and Concordia to the west, and the McCord Museum and McGill to the east. Works by Canadian and international artists will be presented along the route, which will be lined with the flags of Canada and the provinces as well as those of some 200 countries. La Balade will be a reminder of how Expo 67, which attracted 50 million visitors, was an open window on the world – a memorable moment for both Quebec and Canada. Centred around the theme What Does the Image Stand For?, MPM 2017 will probe the concept of photographic evidence in all its guises. The event will feature works that question the status of the photograph as a recording of the real, and will examine the fantastical and sublimated character of reality. Viewers will be encouraged to take a critical stance toward the testimonial value of lens based images, be they still or moving. Join an evening filled with inspiration and hope, at The Leukemia & Lymphoma Society of Canada’s Light The Night Walk in Montreal on October 14 at twilight, and help make a difference in the lives of more than 110,000 Canadians affected by blood cancer. Hold your illuminated lanterns high; red for supporters, white for patients and survivors and gold for loved ones lost. Together we can bring light to the dark world of cancer. Cité Mémoire is an outdoor projection circuit unfold throughout Old Montréal. It is inspired by the history of Montreal. It invites you to meet a host of characters who’ve witnessed the city’s evolution first-hand through a series of over twenty night-time tableaux. This year four new projection tableaux will be added including Cité Mémoire’s Grand Tableau, an overview of more than 375 years of Montréal’s history projected onto the imposing walls of the Montréal Courthouse. The Botanical Gardens will be hosting their gorgeous Gardens Of Light lantern festival this September 2017. Starting on September 8th and running until October 31st, the event will take place between 9 AM and 9 PM, although the lanterns will only light up at night. Lanterns with different shapes are placed everywhere in the gardens and temples. Humans, animals, but also objects and plants are really well made and incredibly colorful. Lighting designers have worked on several ideas to light the Chinese garden and the Japanese garden and this year’s theme between sky and water. An important fact about this event is that the lanterns are imagined in Montreal (Canada) and then, created in Shanghai (China), following traditional techniques. Gardens of Light is an amazing event for all people who want to enjoy and share a colorful and enlightened night in Montreal. The 13th MIBFF will take place from September 27 to October 1st 2017. From the Caribbean to the Indian Ocean, Africa to North America, via Europe and South America, MIBFF wants to share its most striking black cinematic discoveries while engaging in a wider cultural, social and socio-economic debate. MIBFF has become today’s largest black film festival in Canada. It is a dynamic, bold and innovative festival that fosters the development of the independent film industry and which offers a new and refreshing look on a growing, rich and original film industry. The mission of this foundation is to create world-class events that attract people from all over the world, generating revenues for the foundation. These activities are a celebration and acknowledgement of a unique community and culture. That is, the gay community and the gay culture. A celebration that is non-discriminatory and includes men and women, straight and gay. ALL proceeds from these events are generated by and remitted to the BBCM Foundation for the main causes it supports. A main cause that affects more and more the whole world. A cause that affects women, men and children, straight and gay. The cause is AIDS. The foundation has been a large and key supporter to most of Montreal’s AIDS support organizations for the last 13 years. These organizations provide day-to-day financial, health and social resources for people living with AIDS. The foundation also supports gay and lesbian community groups. Montreal has a ridiculous amount of Food Festivals. Some of them are very specific and don’t necessary appeal to everyone’s personal taste. But there is one festival in particular that is sure to satisfy even the pickiest of eaters.Next fall, October 1-7, 2017, Montreal will host a new culinary event: La Pizza Week! During the first days of October, greater Montreal will turn into a real battlefield to select the restaurants that offer the best Pizza in town. LA PIZZA WEEK is a week-long, family-friendly celebration of everyone’s favorite comfort food. Restaurateurs from across the city, will compete for honors and bragging rights in 10 categories with 2 prizes being awarded in each category. A great jazz crossroads in the heart of Montreal’s fall season, Montreal’s OFF Jazz Festival, will be taking the city by storm from the 5th through the 14th of October 2017 for an 18th edition. It was in the winter of 1999 that the idea first took seed among a tight-knit group of Montreal jazzmen: they wished to create an event in their own image, a custom-made vehicle that would encourage creative expression from Montreal. They decided to take charge of their destiny by developing their own festival. 18 years later, the festival has become a mainstay of Montreal’s cultural life. Still run by a committee composed of a majority of musicians, the festival has been able to preserve the values that underlie its mission. One of the most eagerly awaited events of the year, Oktoberfest gathers over 40 microbreweries from different regions in Québec under the big tent in the parking area in front of Atwater Market. If you love craft beer, come and discover the province’s best brews during these three days of tasting. Then, take a stroll through the market and stop at the various merchants’ stands to sample what they have on offer, in a festive atmosphere. If you can’t make it to Munich, the next best thing is Oktoberfest in Montréal’s Public Markets! This is the biggie of local street food events, attracting up to 20,000 people at a time. Every first Friday of the month, 45 to 50 food trucks gather in the Sun Life Financière Esplanade outside the Olympic Stadium, where there’s beer and wine and live music. First Fridays go from 4 p.m. to 11 pm, October 7th. Nothing can stop a princess from a courageous adventure when Disney On Ice presents Dare to Dream skates into to Montreal. Join your hosts Mickey Mouse and Minnie Mouse as they share the heroic stories of four of your favourite Disney Princesses. Laugh along with Disney’s hair-raising escapade, Tangled, as Rapunzel, Flynn and Maximus embark on an uproarious expedition that soars to new heights! Travel to the enchanted forest with Snow White and the Seven Dwarfs as she escapes from the Evil Queen. Watch as Cinderella’s dreams come true with a little help from her animal friends and the Fairy Godmother. Boogie to the beat of the bayou with Princess Tiana and Prince Naveen from Disney’s The Princess and the Frog, in a magical, musical journey. Make memories your whole family will treasure for a lifetime, while dancing and singing along, as the Disney Princesses inspire you to Dream Big! An invitation to enjoy a weekend filled with sequins, sensuality, fishnet stockings, and lascivious dancing. You’ll be charmed by performers from around the world displaying their best assets. Three evenings, three exceptional parties will help you relive the atmosphere of the cabaret. Put on your Hollywood ritz and glitz and step on to the red carpet at Club Soda. Founded in 1999, this traditional ghost walk travels the cobblestone streets of Old Montreal. Street theatre at its best, guides entertain and frighten with grim stories of witches, criminals and, of course, ghosts. The tour is even populated with lost souls! Be prepared to encounter fantastic performers in macabre costumes and makeup as you drink in the late-night ambience of the old city. Learn the history of the area along with its gruesome stories, dark legends and other paranormal phenomena. This tour is scarier than most and is recommended for kids aged 12 and up. Montreal ghost walk in 2017 run Saturdays from May 13 to July 1, 2017; Wednesdays, Thursdays from July 4 to September 1, 2017; and Saturdays from September 2 to October 21, 2017. Go on a Montreal ghost walk June through October, and you’ll never see Old Montreal’s streets and landmarks in quite the same way. The zombie walk is a public manifestation, where participants walk around dressed as zombies and have zombie makeup. It started out in Montreal as a small, grass roots, almost flash mobby gathering of people in 2008. By 2011, the walk was huge, becoming an undeniable highlight of Halloween in Montreal. By 2013, the crowd reached the ranks of five figures, 10,000 undead roaming the streets with apocalyptic abandon. This year the event will be held in October 2017 (the exact date will be announced as we close in on Halloween). Joining the Montreal Zombie Walk is quite simple, you just show up in appropriate zombie attire at the time and place to be announced by organizers and WALK. Buckle up for a breakneck ride through bass, R&B and hip-hop concoctions with Dance Mania legend DJ Deeon, pioneering ghetto-tech DJ Gary Chandler, one-time Roc-A-Fella sound architect Just Blaze, as well as a gifted ensemble of Red Bull Music Academy participants led by rising singer and multi-instrumentalist River Tiber and Perth’s ASAP Rocky-approved golden voice Kucka. Spread over three rooms, it will be a chance to get familiar with sounds new and old from around the world, all cloaked in a sweat-inducing dance party. Rooms: R&B: Kidä, Kucka, River Tiber BASS: DJ Deeon, Garry Chandler, Beatrice, LOA, Oceantied, Shake It Maschine, Drippin, Swisha HIP-HOP: Just Blaze, Mirac, Sayge, Taskforce, Iskeletor, DJ RayRay. The Big Fashion Sale by Quebec Designers (also known as the Braderie) is a well established, popular semi-annual shopping event (some people even call it “the mecca of fashionistas”). Begun in 1994 with some 50 customers, the Braderie now attracts 25 000 people over four days in Old Montreal. From 60 to 100 fashion designers participate each edition, which is the reason why one can find just about everything at the sale: women’s and men’s ready to wear, children’s fashions, coats, sportswear, leather, fur, shoes, bathing suits and lingerie, casual wear, accessories (hats, jewellery, etc…). The Braderie is definitely the place to discover what Montreal and Quebec City have to offer in fashion. From the well established to the newcomers, the participating Quebec labels get to liquidate their samples and overstock and their faithful clients get to purchase the hot new looks of the season at amazingly low prices (50-80 % off). The Braderie is also a rare opportunity to meet and chat with the designers. In short, the Braderie is a win-win strategy to support the industry. Conceived and produced by Alchimies, Créations et Cultures, the Arab World Festival of Montreal (Festival du Monde Arabe de Montréal or FMA) is a thematic event dedicated to the meeting of Arabic and Western cultures. Through its four sections – Performing Arts, Culture Forum, Cinema, and Orientalys – the FMA presents modern bodies of work through original productions in dance, music, theater and multidisciplinary arts, debates, conferences, lectures and films. Representing a myriad of tendencies and artistic orientations that allow reflection and experimentation, the FMA welcomes artists, filmmakers and intellectuals from all cultural horizons, local and international broadcasters and producers in order to build a space dedicated to cultural exchange and “breeding” as well as to provide festival-goers with a wide range of first-rate activities. Through its different aspects, the FMA addresses and appeals to a public comprised of citizens of all origins, of music lovers, cinema enthusiasts and literature devotees alike, as well as of all those who are eager to discover, to understand and to share the Arabic culture. The 18th FMA edition will start at October 27th, 2017.